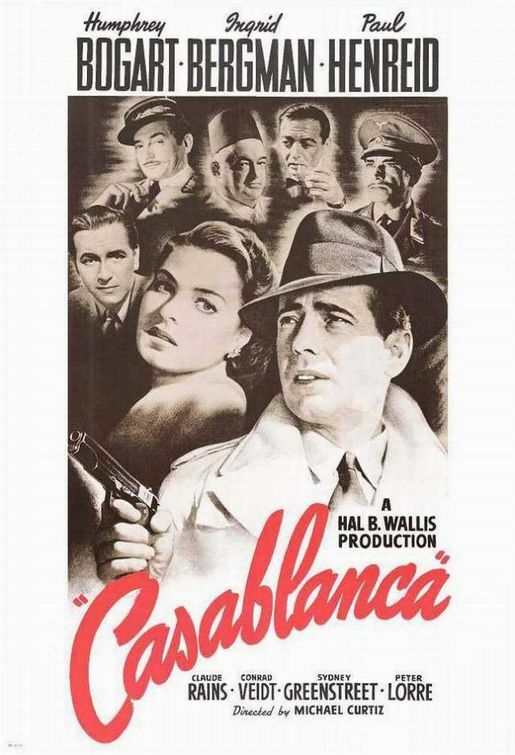 Winner of three Academy Awards (Best Picture, Director and Screenplay) and responsible for some of the most quoted movie lines of all time, Casablanca is well deserving of its status as a silver screen classic. The movie is based on the play “Everybody Comes To Rick’s”, and stars the luminous Ingrid Berman alongside Humphrey Bogart, who boasts a magnetic stage (or screen, if you will) presence. The chemistry between the two leads is restrained, yet palpable, and makes for incredibly tense viewing. The film itself derived its name from a Moroccan port town of strategic importance during World War Two, which was the site of a British-American invasion of French North Africa in 1942, known as Operation Torch. Indeed, the film was released against the backdrop of WW2, premiering worldwide on November 26th, 1942. While it was mildly successful during its first run, it was only later that it grew in popularity. The movie follows American Rick Blaine who owns a bar/gambling den in Casablanca, frequented by a colorful collection of characters – refugees and those hoping to escape to America, German, French and Italian officials, drinkers, gamblers and petty crooks. As fate would have it, Rick’s former lover, Ilsa, walks into the bar – cue the iconic gin joint line! He is still bitter about the way their relationship ended, as she left him without an explanation. Turns out, when they fell in love in Paris two years prior, Ilsa was under the impression that her dear husband was dead in an attempt to escape a concentration camp. Turns out, he was sick, but alive and in hiding – and when Ilsa discovered this, she fled to join him. Her husband, Victor Laszlo, also happens to be an infamous fugitive Czech Resistance leader, and the couple need to leave for America to avoid Victor’s arrest/persecution, and to enable him to continue his work fighting against the Nazis. It just so happens that Rick is in possession of two letters of transit, which would allow whoever holds them to travel to places otherwise under German control or to flee the country. I simply adore this black and white classic – it elicits an emotional response without becoming overly-patriotic, the leads are electrifying in their interactions, and the fantastic one-liners add a witty edge to the rather dark proceedings. There’s a reason the movie is consistently rated as one of the best films of all time – so do give it a watch!